What is happening to sea levels? That was perhaps the most controversial issue in the 4th IPCC report of 2007. The new report of the Intergovernmental Panel on Climate Change is out now, and here I will discuss what IPCC has to say about sea-level rise (as I did here after the 4th report). Let us jump straight in with the following graph which nicely sums up the key findings about past and future sea-level rise: (1) global sea level is rising, (2) this rise has accelerated since pre-industrial times and (3) it will accelerate further in this century. The projections for the future are much higher and more credible than those in the 4th report but possibly still a bit conservative, as we will discuss in more detail below. For high emissions IPCC now predicts a global rise by 52-98 cm by the year 2100, which would threaten the survival of coastal cities and entire island nations. But even with aggressive emissions reductions, a rise by 28-61 cm is predicted. Even under this highly optimistic scenario we might see over half a meter of sea-level rise, with serious impacts on many coastal areas, including coastal erosion and a greatly increased risk of flooding. Fig. 1. Past and future sea-level rise. For the past, proxy data are shown in light purple and tide gauge data in blue. For the future, the IPCC projections for very high emissions (red, RCP8.5 scenario) and very low emissions (blue, RCP2.6 scenario) are shown. Source: IPCC AR5 Fig. 13.27. In addition to the global rise IPCC extensively discusses regional differences, as shown for one scenario below. For reasons of brevity I will not discuss these further in this post. Fig. 2. Map of sea-level changes up to the period 2081-2100 for the RCP4.5 scenario (which one could call late mitigation, with emissions starting to fall globally after 2040 AD). Top panel shows the model mean with 50 cm global rise, the following panels show the low and high end of the uncertainty range for this scenario. Note that even under this moderate climate scenario, the northern US east coast is risking a rise close to a meter, drastically increasing the storm surge hazard to cities like New York. Source: IPCC AR5 Fig. 13.19. I recommend to everyone with a deeper interest in sea level to read the sea level chapter of the new IPCC report (Chapter 13) – it is the result of a great effort by a group of leading experts and an excellent starting point to understanding the key issues involved. It will be a standard reference for years to come. Proxy and instrumental sea level data indicate a transition in the late 19th to the early 20th century from relatively low mean rates of rise over the previous two millennia to higher rates of rise (high confidence). It is likely that the rate of global mean sea level rise has continued to increase since the early 20th century. Adding together the observed individual components of sea level rise (thermal expansion of the ocean water, loss of continental ice from ice sheets and mountain glaciers, terrestrial water storage) now is in reasonable agreement with the observed total sea-level rise. 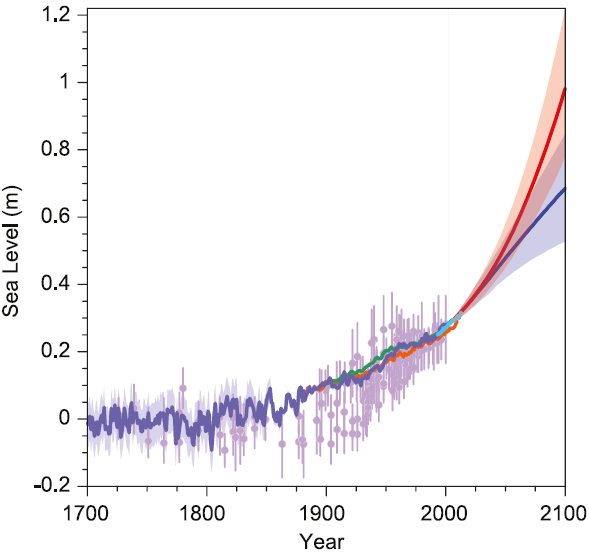 Models are also now able to reproduce global sea-level rise from 1900 AD better than in the 4th report, but still with a tendency to underestimation. 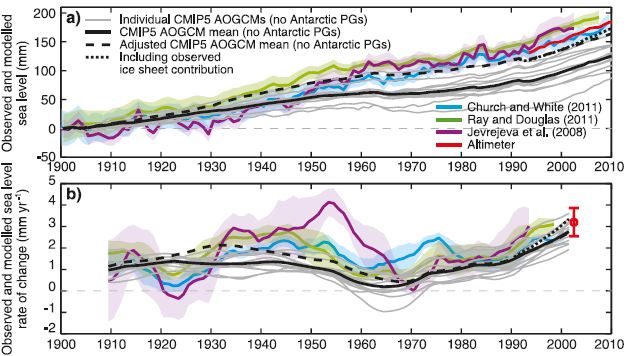 The following IPCC graph shows a comparison of observed sea level rise (coloured lines) to modelled rise (black). Fig. 3. 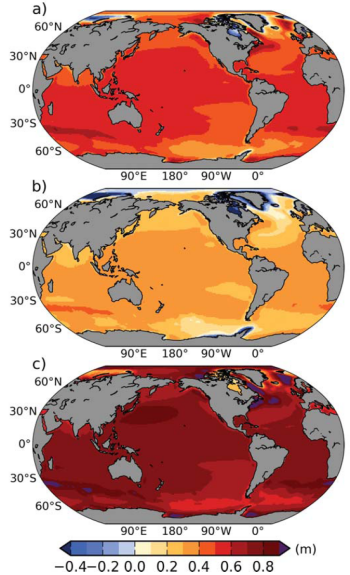 Modelled versus observed global sea-level rise. (a) Sea level relative to 1900 AD and (b) its rate of rise. Source: IPCC AR5 Fig. 13.7. Taken at face value the models (solid black) still underestimate past rise. To get to the dashed black line, which shows only a small underestimation, several adjustments are needed. (1) The mountain glacier model is driven by observed rather than modelled climate, so that two different climate histories go into producing the dashed black line: observed climate for glacier melt and modelled climate for ocean thermal expansion. (2) A steady ongoing ice loss from ice sheets is added in – this has nothing to do with modern warming but is a slow response to earlier climate changes. It is a plausible but highly uncertain contribution – the IPCC calls the value chosen “illustrative” because the true contribution is not known. (3) The model results are adjusted for having been spun up without volcanic forcing (hard to believe that this is still an issue – six years earlier we already supplied our model results spun up with volcanic forcing to the AR4). Again this is a plausible upward correction but of uncertain magnitude, since the climate response to volcanic eruptions is model-dependent. The dotted black line after 1990 makes a further adjustment, namely adding in the observed ice sheet loss which as such is not predicted by models. The ice sheet response remains a not yet well-understood part of the sea-level problem, and the IPCC has only “medium confidence” in the current ice sheet models. One statement that I do not find convincing is the IPCC’s claim that “it is likely that similarly high rates [as during the past two decades] occurred between 1920 and 1950.” I think this claim is not well supported by the evidence. In fact, a statement like “it is likely that recent high rates of SLR are unprecedented since instrumental measurements began” would be more justified. The lower panel of Fig. 3 (which shows the rates of SLR) shows that based on the Church & White sea-level record, the modern rate measured by satellite altimeter is unprecedented – even the uncertainty ranges of the satellite data and those of the Church & White rate between 1920 and 1950 do not overlap. The modern rate is also unprecedented for the Ray and Douglas data although there is some overlap of the uncertainty ranges (if you consider both ranges). There is a third data set (not shown in the above graph) by Wenzel and Schröter (2010) for which this is also true. The only outlier set which shows high early rates of SLR is the Jevrejeva et al. (2008) data – and this uses a bizarre weighting scheme, as we have discussed here at Realclimate. For example, the Northern Hemisphere ocean is weighted more strongly than the Southern Hemisphere ocean, although the latter has a much greater surface area. With such a weighting movements of water within the ocean, which cannot change global-mean sea level, erroneously look like global sea level changes. As we have shown in Rahmstorf et al. (2012), much or most of the decadal variations in the rate of sea-level rise in tide gauge data are probably not real changes at all, but simply an artefact of inadequate spatial sampling of the tide gauges. (This sampling problem has now been overcome with the advent of satellite data from 1993 onwards.) But even if we had no good reason to distrust decadal variations in the Jevrejeva data and treated all data sets the same, three out of four global tide gauge compilations show recent rates of rise that are unprecedented – enough for a “likely” statement in IPCC terms. For an unmitigated future rise in emissions (RCP8.5), IPCC now expects between a half metre and a metre of sea-level rise by the end of this century. The best estimate here is 74 cm. On the low end, the range for the RCP2.6 scenario is 28-61 cm rise by 2100, with a best estimate of 44 cm. Now that is very remarkable, given that this is a scenario with drastic emissions reductions starting in a few years from now, with the world reaching zero emissions by 2070 and after that succeeding in active carbon dioxide removal from the atmosphere. Even so, the expected sea-level rise will be almost three times as large as that experienced over the 20th Century (17 cm). This reflects the large inertia in the sea-level response – it is very difficult to make sea-level rise slow down again once it has been initiated. This inertia is also the reason for the relatively small difference in sea-level rise by 2100 between the highest and lowest emissions scenario (the ranges even overlap) – the major difference will only be seen in the 22nd century. There has been some confusion about those numbers: some media incorrectly reported a range of only 26-82 cm by 2100, instead of the correct 28-98 cm across all scenarios. I have to say that half of the blame here lies with the IPCC communication strategy. The SPM contains a table with those numbers – but they are not the rise up to 2100, but the rise up to the mean over 2081-2100, from a baseline of the mean over 1985-2005. It is self-evident that this is too clumsy to put in a newspaper or TV report so journalists will say “up to 2100”. So in my view, IPCC would have done better to present the numbers up to 2100 in the table (as we do below), so that after all its efforts to get the numbers right, 16 cm are not suddenly lost in the reporting. Table 1: Global sea-level rise in cm by the year 2100 as projected by the IPCC AR5. The values are relative to the mean over 1986-2005, so subtract about a centimeter to get numbers relative to the year 2000. And then of course there are folks like the professional climate change down-player Björn Lomborg, who in an international newspaper commentary wrote that IPCC gives “a total estimate of 40-62 cm by century’s end” – and also fails to mention that the lower part of this range requires the kind of strong emissions reductions that Lomborg is so viciously fighting. The breakdown into individual components for an intermediate scenario of about half a meter of rise is shown in the following graph. Fig. 4. 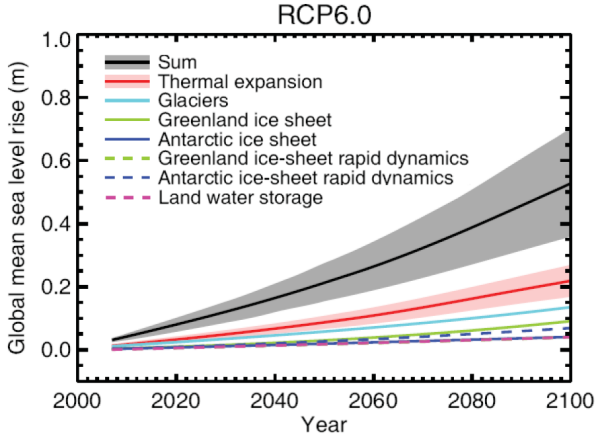 Global sea-level projection of IPCC for the RCP6.0 scenario, for the total rise and the individual contributions. AR4: 37 cm (this is the standard case that belongs to the 18-59 cm range). AR4+suisd: 43 cm (this is the case with “scaled-up ice sheet discharge” – a questionable calculation that was never validated, emphasised or widely reported). We see that the new estimate is about 60% higher than the old standard estimate, and also a lot higher than the AR4 attempt at including rapid ice sheet discharge. The low estimates of the 4th report were already at the time considered too low by many experts – there were many indications of that (which we discussed back then), including the fact that the process models used by IPCC greatly underestimated the past observed sea-level rise. It was clear that those process models were not mature, and that was the reason for the development of an alternative, semi-empirical approach to estimating future sea-level rise. The semi-empirical models invariably gave much higher future projections, since they were calibrated with the observed past rise. However, the higher projections of the new IPCC report do not result from including semi-empirical models. Remarkably, they have been obtained by the process models preferred by IPCC. Thus IPCC now confirms with its own methods that the projections of the 4th report were too low, which was my main concern at the time and the motivation for publishing my paper in Science in 2007. With this new generation of process models, the discrepancy to the semi-empirical models has narrowed considerably, but a difference still remains. Should the semi-empirical models have been included in the uncertainty range of the IPCC projections? A number of colleagues that I have spoken to think so, and at least one has said so in public. The IPCC argues that there is “no consensus” on the semi-empirical models – true, but is this a reason to exclude or include them in the overall uncertainty that we have in the scientific community? I think there is likewise no consensus on the studies that have recently argued for a lower climate sensitivity, yet the IPCC has widened the uncertainty range to encompass them. The New York Times concludes from this that the IPCC is “bending over backward to be scientifically conservative”. And indeed one wonders whether the semi-empirical models would have been also excluded had they resulted in lower estimates of sea-level rise, or whether we see “erring on the side of the least drama” at work here. What about the upper limit? I’m usually suspicious of articles that promise to look “behind the scenes”, but this one by Paul Voosen is not sensationalist but gives a realistic and matter-of-fact insight into the inner workings of the IPCC, for the sea-level chapter. Recommended reading! And the IPCC sea-level authors have a good letter to Science about their findings. (*) Note: For the AR5 models table 13.6 gives 58 cm from 1996; we made that 60 cm from 1990. I’m a moderately informed layperson, I suppose. I found this to be one of the best IPCC summary pieces I’ve seen. But what is the worst-case by 2300, based on a worst-case of about 1.5m by 2100, as argued by Levermann and Grinsted? That would imply about 3 cm/yr of SLR by 2100, and probably some further acceleration during the next century, right? So would it be reasonable to say the worst-case for 2100-2300 is about 4 meter/century, so almost 10 meters of total SLR by 2300? IPCC could not reach consensus on the value of the semi-empirical models. But should policy makers, and citizens, only use science on which a great deal of consensus exist? Or should they use a risk and precautionary approach and conclude that a worst-case of about 10 meters by 2300 cannot confidently by excluded by science at this point? Would 10 meters by 2300 as a worst-case be a scientifically sound conclusion? this one by Paul Voosen has a high paywall, sorry to say. Thanks for this thorough and interesting post. It’s nice to see that the SLR work in AR5 is not as egregiously conservative as in AR4, but it still very much sounds like there is a hyper aversion to Type I errors which leads to these still likely conservative low ranges (in particular, the unwillingness to explore the upper tails of the distribution). Very useful. I reposted it to Facebook just now, adding the figures in feet; more people (of the type we wish to influence) understand feet much better! Sorry — The key IPCC findings about past and future sea-level rise: (1) global sea level is rising, (2) this rise has accelerated since pre-industrial times and (3) it will accelerate further in this century. The projections for the future are much higher and more credible than those in the 4th report but possibly still a bit conservative. For high emissions IPCC predicts a global rise by 52-98 cm (that’s 5 to 10 meters; a meter equals 3 + feet) by the year 2100, which will threaten the survival of coastal cities and entire island nations.Even with aggressive emissions reductions, a rise by 28-61 cm 3 to 6 meters; or 5 to 18 feet, is predicted. Goodbye Galveston. Nice paper. Do we know for which element (steric or water transfer from ice) and in which proportion climate models tend to underestimate the historical SLR , when their results are compared to climatologies? Thanks. But the upper limit might be higher than the upper limit estimate? A lot could and will change since the entire planets gravitational field will readjust, which means more seismic activity. And SLR is likely to be exponential, hence why it accelerates. Coastal protection needs to account for higher storm surges, affected by storm strength, storm size and uneven SLR distribution and re-configuring of ocean flow. Even if you have coastal protection in place, a tsunami could easily roll over it. But the coastal levee, 10 meters tall, 3 meters wide and running for 2.4 kilometers, crumbled in the March 11 tsunami. Some survivors said residents may have placed too much faith in the levee, known locally as “the Great Wall,” leading to a higher number of dead and missing people. “The tsunami’s height was twice that of the levee,” said Giichi Kobayashi, a 76-year-old fisherman in the district, his face stiffening. John Burgeson: 52-98cm is half to one meter. You have misplaced a decimal point. I don’t understand how adding [a] the upper limit of the estimate of the MBAIS collapse contribution (several decimeters, so let’s say .5 m), to [b] the upper limit of the “likely” range, provides a “worst case” estimate (if that is what is done in the Levermann/e360 quote/link above). Don’t you FIRST have to, somehow, assess [c] the upper limit of the *very* likely, or *extremely* likely, range (w/o collapse contributions) and THEN add [a] the upper limit of the collapse contribution (ie, and THEN add the .5 m) ? That is, wouldn’t you need to do something similar to what Aslak Grinsted did (as in the Grinsted/glaciology link above), but with some kind of different (component-based) assessment of [c] (ie, not a sigma-based derivation that starts from the interpreted-as/treated-as “likely” ranges)? Finally, either way, an assessment like this would give the worst case based, at least for some components, on RCP8.5, the worst of the scenarios, but not in itself a “worst case,” right? Grateful for corrections, clarifications, comments, answers. Thanks. From the linked table by #3 Aslak Grindsted, it seems like the FAR gave the most realistic estimate of the sea level rise, even better than AR5, according to the “ice sheet experts” as well as taking into the account the bias in leaving the semi-empirical models out. Could it be the ESLD effect getting stronger due to greater mass media pressure not to be alarmist? This all begs the question, what is a reasonable upper-limit for the year 2100? >1m? >2m? Do the AR5 regional sea level rise estimates take into account gravitational effects of ice cap reductions? As per the discussion in Jerry Mitrovica’s video? 1)The ANDRILL results seem to give a timescale of 1kyr for WAIS collapse. I recall a comment by Bindschadler stating that 1Kyr should be seen as an upper limit. And I recall Mercer’s warnings from many years ago. Every millimeter of SLR from Greenland is accentuated at the other end of the world in Antarctica, as Mitrovica has pointed out, and every millimeter lifts the ice shelves stabilizing the Antarctic glaciers. Last year Greenland melt at 574 Gton (GRACE) was a millimeter and a half averaged globally, more down south. And as the southern ocean warms, the circumpolar winds tighten their girdle, intensifying the Ekman rise of warm circumpolar deep water melting into the vasty deeps beneath Antarctica. Sadly, the average person will believe it when and only when they see it. *And no one of consequence will be interested in stories of those over 75 recalling when they were 15. I was able to get past the paywall at The Chronicle for Higher Education. Seemed like a good synopsis of the characters. But I wouldn’t know any better, either way. What is left unsaid is that the attacks from one side for having too high numbers will be coming from denialists. The attacks from the other side for having too low numbers will be coming from those far more informed about the topic and disappointed by what didn’t make it into the report. Could someone explain what figure 3’s legend means by the annotation “No Antarctic PGs”? Peer review in action, posts 14-17. Brennan, peer review’s meant to be done _before_ publication (grin). Has anyone checked whether John B has fixed that error? Good example of why peer review is done — and was needed. It’s a low threshold to catch obvious errors before they go out. So even this worst-case may not be a worst-case, but it seems we simply cannot really know at this point. It is amazing to me that there can be so much uncertainty about what would seem to be an extremely simple, well understood type of physical change–the melting of ice. But as we have seen with the wildly inaccurate (all on the conservative side) models for Arctic sea ice melt, modeling the seemingly simple process of ice melting in a warming world turns out to be not at all simple or straight forward. And if this process of water changing state, which is pretty much just a process of physics and a bit of chemistry, is so very easy to get wrong–specifically, is so easy to model too conservatively so the models predict wrongly that it will be a very slow process when in fact it seems to be a much faster process–how confident can we be that other models and estimates of processes that involve multiple feedbacks that include chemical and biological interactions as well as physical ones aren’t even more wildly inaccurate on the ‘conservative’ side? Thanks to Stefan for this summary of what currently seems to be the biggest problem in climate science. John Church, Peter Clark and the other 12 lead authors of Chapter 13 have clearly been struggling to deal with a complex problem. But they are in a situation where for the science it is sometimes better to be a bit conservative, and then proved wrong, rather than exaggerate the problem, and then become totally discredited. That is not risk management in the normal sense, but it has come up in some earlier IPCC assessments. However, while semi-empirical models are being recognised in the report, more could be done to merge these in with process based models. For example, some other areas of science are using ways of combining aleatory and epistemic forms of uncertainty to produce fuzzy intervals or developments of the Dempster-Shafer approaches which deal with ranges going from what is ‘belief’ (e.g current process models) to what is ‘plausible’ (e.g semi-empirical). Recognition of these different forms of uncertainty is shown a bit subtly by Chapter 13 giving 5-95% ranges from the models and then saying that these are ‘likely’, i.e only believed to be 66% of the total range. The synthesis in section 13.8 also says that neither a ‘very likely’ range nor upper bound can be defined. And while for planning purposes that raises the question as to whether more of the residual 34% of the full range is on the high side or low side of the ‘likely’ range, this section does say that coastal planning needs to be considered in a risk management framework. While the IPCC approach to uncertainty could be improved, getting coastal planning to take account of even 0.5 m SLR seems an even bigger challenge. So Figure 13.25 which shows the very large multiplication factors that this causes for coastal flooding could actually be the best wake up call coming out of the chapter. [Response: Thanks for your thoughts, Martin. Coastal planning: here in Germany the ongoing process of upgrading our coastal defences is based on the assumption of up to 1.5 meters of sea-level rise. Any volunteer expert willing to write a post on those multiplication factors in Fig. 13.25, showing how even for 0.5 m SLR the frequency of flooding events of a given height increases drastically in many locations? This is am important issue which I did not cover above. Would you feel comfortable providing an analysis of the impressive discrepancy between the IPCC estimates and those of Hanson and Sato, who state that more than 5 meters SLR is likely by 2100? Are there mistaken assumptions or missing feedbacks at play? Thanks. What’s the rough breakdown of sea level rise attribution for human GHG emissions and emergence from the little ice age? Huh? That doesn’t even make any sense. The LIA ended over a century and a half ago. For warming to occur there has to be an energy source. Mr. Sun ain’t it. … what are the shapes of the ice sheet mass loss curves for Greenland and West Antarctica? Is there evidence that they may be exponential? It’s too early to tell, as shown by Fig. 1 above. The picture may begin to be clearer within the next several years. The problem is, by the time the data record is long enough to be convincing, it may be exceedingly difficult or impossible to prevent sea level rise of many meters. The Little Ice Age and the Medieval Warming were named by people experiencing the local climate in parts of Europe. The people experiencing them assumed they were global climate changes. You’ll find bloggers passionately arguing that they must have been global, because [Anything But The IPCC], and since no evidence of them appears in global sea level records, that must prove climate change doesn’t affect sea level. But absence of evidence is not evidence of absence. A great many people have looked at the paleo record at many locations, and more such records — each for a particular site — are being published. A global event would have happened everywhere at the same time. So far that pattern hasn’t been found, near as I can tell. Instead local events happened that didn’t coincide. Check your source if you read that either warm period or “little ice age” was global — is it a blogger’s claim? Be skeptical. It’s part of a PR story, if so. Or was it a science journal? Weigh the evidence. Tell us where you found it. The Hansen “Fig.1” link I tried to post broke. Ten years ago almost believed the Antarctic could be unstable, and few thought that the geology we could see left behind when the continental ice caps melted indicated any kind of rapid event. Some few thought meltwater could go right through glaciers year after year, build up, and burst out. One glaciologist said that glacial ice would close any openings during each winter, not get riddled by holes that would persist. I was, there, reading and asking questions. You can see I was not as worried then as Hansen (grin) but more concerned than the ice experts quoted there were, then. The inline replies at that link are appropriately skeptical, as the scientific evidence began to accumulate. Drumlins, for example — did the ones found all over form slow, or fast? That has long been debated. Then someone watched one form — rapidly. So, if drumlins, found everywhere the ice caps melted, are evidence of fast change then — hmmmmm. Scientists don’t yet have evidence to say continental ice could change fast — but have long believed it wasn’t likely. It is not quick so simple as the “melting of ice.” Predictions of an ice-free Arctic ranged from 2013 (Maslowski) to 2058 (Liu, et. al.) to 2100 (Jahn and Hlland). Much of this uncertainty is related to the complex interaction between the Arctic air and water leading to the absorption of energy in the summer and radiation in the winter. Predicting the melting of the Greenland and Antarctic glaciers is much more complex. Add to the previous factor the IPCC projected 21st century temperature rise of 0.3 – 4.8C (depending on the RCP interval selected), and it becomes surprising that the predicted sea level rise is contained in such a small interval. All this does not even take into account plate tectonics. Barging in (sorry!). I’m not an expert in anything but wringing unwanted flood water out of the lower floor of my house; I can offer only anecdotal information. A sea level rise of “only” 0.5m can be quite drastic indeed. Why? Because there’s an extraordinary difference between a house with no water on the floor versus one with “just” a centimeter inside where it’s not supposed to be, when one takes into account such things as sharing a house with water or leftover deposits of silt on the floor. Indeed it hardly matters whether there’s half a meter or only a centimeter of wrongly placed water in a home; it turns out that any interior flooding of whatever amount effectively makes a house useless for its intended purpose. In our case we don’t have a problem with the ocean but our story may nonetheless be helpful. Our own house was constructed in a context where it coexisted happily with the outdoors– just barely– similarly to many homes in immediate vertical proximity to water. It turns out that only a small statistical difference one way or another in rainfall intensity is what allows our house to be livable or not. We’re lucky that we can engineer our way out of our problem, for the time being. Where do Hansen & Sato say 5m of SLR by 2100 is likely? As I understand them they think 2-3 meters by 2100 may be possible under BAU. And they point out that with a 10-year doubling time of the ice sheet contribution to SLR you would get about 5m around 2100. It seems Hansen doesn’t rule this out entirely, but I don’t think he has said it’s likely. He and Sato do point to a plausible negative iceberg cooling feedback which may limit the worst-case SLR by 2100 to about 2.5m and the rate of rise to about 5-6m per century in the next centuries. This is pretty close to what some semi-empirical models seem to find as a worst-case. Try copying it into another browser window and it’ll work. Because the models work better with temperature than melt. Paleodata and modern data support the temperature data but not the melt data. This could result in erroneous temperature data as albedo changes, but I’d amateurishly think that the end result for temperature would be closer to reality than the melt predictions. sea rising is a natural phenomena – sediments washed from the hills into the -#b] places like lake Chad, Aral sea getting dry = less water on the land = more water into the sea. 1. Tx for the info. If (probably when) SLR=16cm/decade average people near the coast will finally notice. The LIA represents a roughly one degree C increase in global temperature that has not fallen since. After reading your comment, I built a 1-D, transient model of the Greenland ice sheet. With a step change in temperature at the surface of the ice sheet, and assuming a constant thickness of 2km, the time required for the mid-point of the ice sheet to reflect only 50% absorption of the energy reflecting the temperature increase is… 159.5 years. So, you see, my question makes sense. I’m still waiting for an estimate. A few years ago I attended a great 1-day session on Preparing for Sea Level Rise in the Bay Area – A Local Government Forum. It started with talks by scientist on what was known and unknown, then on to strategies for dealing with such, in an area that has a large amount of valuable infrastructure right at sea level, including Silicon Valley and 3 airports. a) Sewage plants like to be near sea-level, but below where people live. b) In the long term, it might be most-effective to pick a line to defend a ways up the hills … but oddly, those who own property below tend to think otherwise. c) One can build dikes, but when it rains, the water does not flow uphill from areas now below sea level. This is different from a storm that temporarily floods some area and then drains away. d) One of the main roads is Rt 101, and it is just barely above high tide. The encouraging part of the experience was spending a day with town planners who passionately cared what their towns would look like in 50-100 years, wanted to understand the science and talk about strategies. I would feel better if I though the SF Bay Area was necessarily a representative place. Thanks, Jim. I hadn’t thought of that. @41 from stefanthedenier is there to provide us with some comedy relief, right? This might belong in the Unforced variations thread, but I was hoping someone reading this thread might recall the reference. Would be glad for leads. stefanthedenier: Wow! I didn’t realize there was one website with so many scientific inaccuracies in one place! If I were so inclined, I could spend weeks refuting each and every one of the supposed “facts” on this site. But I am not so inclined. I have a life. stefanthedenier: “Aral sea getting dry” as a natural phenomenon. STD is getting his anthropocene all jumbled.